Four serial ports, onboard flash, RTC, 17 I/O lines, optional Wi-Fi. Member of the x20x family. The EM1206 is a miniature BASIC-programmable embedded module. Incombination with the RJ203jack/magnetics, the EM1206 occupies only 34.5x19 mm of board space.Alternatively, the EM1206 can be used with any suitable magnetics andjack. The module's hardware mix, which includes 100Base/T Ethernet, fourserial ports, flash disk, EEPROM, and RTC, has been carefully tailoredto address the typical needs of network-enabled control applications. This makes the EM1206 especially suitable for "connected" edgeproducts such as sensors, network-enabled card readers, actuators, andother lightweight devices. The EM1206 can also support Wi-Fi communications (this requires GA1000 add-onboard), as well as external LCD, keypad, and buzzer. 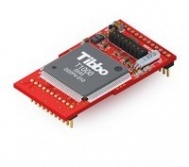 The EM1206 can be ordered standalone or in combination with theRJ203 module. Based on a high-performance purpose-built 88-MHz ASIC (T1000). 10/100BaseT auto-MDIX Ethernet port (no magnetics). Optional Wi-Fi interface (requires GA1000 add-onmodule). Up to 1024KB flash memory for firmware, application, and data. RTC with backup power input. Programmable square-wave output for external buzzer. Up to 17 general-purpose I/O lines (including 8 interrupt lines). Control lines for two external status LEDs. Green and yellow Ethernet status LEDs. Power: 230mA @ 3.3V (100BaseT mode, PLL on). Wln — handles Wi-Fi interface (requires GA1000 add-on module). Ser — up to 4 serial ports (UART, Wiegand, and clock/data modes). Kp — scans keypads of matrix and "binary" types. Button — monitors MD line (setup button). Function Groups: String functions (21 in total! ),date/time conversion functions, and hash calculation functions (md5 andsha1).